Some dreams become nightmares . . .
An invasion is headed for Crosspointe, but three friends will find themselves at war long before the first enemy touches the shore. One man will betray her. Fairlie, a master metalsmith, is discovered to have a rare magical talent that could save Crosspointe from destruction. Against her will, she is forced to make a monstrous sacrifice. What happens next could tear the world apart. The future hangs in the balance. Everything depends on Fairlie. Driven to the edge of sanity and endurance, she must choose who will live and who will die. One man will come face to face with his worst nightmare. The enemy is coming to Crosspointe, but a worse one lurks within. As secrets get ripped open and truths are revealed, Crosspointe’s future looks ever bleaker. 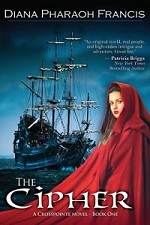 ABOUT THE AUTHOR: Diana Pharaoh Francis is the acclaimed author of a dozen novels of fan¬tasy and urban fantasy. Her books have been nominated for the Mary Roberts Rinehart Award and RT’s Best Urban Fantasy. 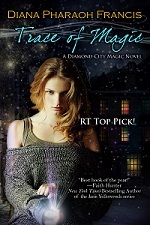 Her Urban Fantasy series include The Diamond City Magic novels. Visit her at dianapfrancis.com and find her on Twitter and Facebook. She thrust to her feet with a sound of frustration, knocking her stool over with a clatter. "They’ve been nattering in there more than a glass. What can they possibly have to talk about? Yes or no—perfectly simple,” she said, stomping down a crooked aisle inside her cramped workroom, her heavy boots thumping on the slate floor. It hardly seemed possible that this crammed-to-the-rafters room was fully as large as her forge on the other side of the obstinately closed doors. The outer workroom contained an array of tables, workbenches, shelves, and cupboards, most of which were heaped with the detritus of her trade: tools, wire, metal scraps, rags, buckets, boxes, casks, ropes, chains, leather aprons and gloves, shards of glass, sylveth and precious stones, and a thousand other little bits and oddments that Fairlie had collected in the expectation that someday they would be useful. She never threw anything away. There was an unusual chill in the air. Outdoors, the winter held on with a desperate grasp, and she’d not yet been allowed into her forge to stir the coals today. Her fingers flexed. She felt invaded, even though she’d invited the guild to evaluate her work. She was nearly ready to toss them all out on their asses. "What is taking so cracking long?” she grumbled when Shaye re­mained silent. She dug her hands deep in her pockets and balled them into fists. Fairlie narrowed her eyes at Shaye, suspecting that he was mocking her. He was one of her two best friends, and yet it wasn’t often easy to tell when he was being serious or sardonic. Usually he didn’t turn the sharp end of his wit against her, since as a result she was just as likely as not to dribble molten metal on his foot, and he disliked it when she resorted to such defenses. Of course, since that first time, he’d taken care to always wear majicked boots when in her workroom. Now he held up his hands as if in surrender, his sleepy brows rising in innocence, though whether real or feigned, Fairlie couldn’t decide. Fairlie stared. There wasn’t the slightest hint of a smile on his thin face, and his gaze was smoldering and implacable. She shook her head. Why was she surprised? He was a majicar and a Weverton, and between the two, more powerful than any one man ought to be. And he wasn’t afraid to use his power to his own ends. Not this time. He made another little shrug, his mouth compressing into a thin line, his dark eyes gleaming hard and bright. "I mean it, Shaye... ,” Fairlie warned. "This is my battle,” she said softly. She’d leaned on his strength since she’d first come to Sylmont as a child—she’d leaned on him and Ryland. But since Ryland had begun traveling the Inland Sea on diplomatic missions for his father, the king, Shaye had adopted the role of Fairlie’s protector. She’d never had to stand on her own two feet. Of late, that had been bothering her, especially as she got closer to achieving her master’s badge and Shaye made no progress toward his. That was her fault. She’d taken all his time and attention, bullying him into helping her in the forge. But that was about to end. "Home?” he repeated, his dark brows winging ominously downward. "This is your home.” His gesture took in her work space. "Next spring? That’s more than a year,” he said incredulously. "And Ryland says that you never learned anything from your tutors,” Fairlie taunted. 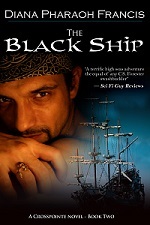 "She sure as the black depths was in a hurry to get rid of you when Toff came around,” he snarled. It was true. Fairlie had been a wild, undisciplined child. Very difficult to manage. Her mother had told her so frequently, as had most everyone in Stanton. She was always running off to the smithy or dangling about a tinker’s cart or climbing up on rooftops or playing in a fire. It was an ac­cepted fact that she would burn down her mother’s house and likely half the village before she was ten. In fact she had come fairly close, lighting her mother’s chimney aflame. Luckily, it was easily doused before much damage could be done. So it was little surprise that when Toff arrived and offered to take Fairlie as his apprentice with no expectations of a fee, Fairlie’s mother happily sent her nine-seasons-old daughter packing with hardly even a kiss. Fairlie could not forget that last expression on her mother’s face as she drove away with Toff—it had been relief. The pain of that look had soon been replaced by her delight at learning what Toff had to teach her. He was gruff, hearty, and boisterous in nearly all that he did. He did not remon­strate against her instincts for fire and danger. He laughed and encouraged her, no matter how underfoot she was, no matter how risky the enterprises she decided to undertake. He had been her father and mother both, and Ryland and Shaye her brothers. It had been all the family Fairlie needed. Between them and her work, she was supremely happy. Then Toff had died, nine months since. For the first time, she was truly on her own. Despite her grief, she’d found she liked making her own choices. But her mother’s letter had reminded her of what she’d left behind. She did want to go home again. More than a small part of Fairlie wanted to show off what she’d become. Another part of her wanted to go back and look again on where she’d come from. Now was an ideal time to go. "She didn’t know that,” Shaye growled. Fairlie gave a little shrug and looked pointedly at his illidre. As beautiful as it was, Shaye had not made it for himself. He couldn’t. He either didn’t know how to or else he didn’t have the strength to shape raw sylveth. A quaking shudder ran down Fairlie’s spine all the way to her heels. Sylveth was a majickal substance that ran through the Inland Sea in rich, silvery ribbons. It was a gift and a curse from the Moonsinger Meris. It was the source of all majick in Crosspointe. But it was also extremely dangerous. Whatever it touched transformed, usually into spawn—dreadful, ravenous monsters straight out of the minds of the maniacal and deranged. Legend said that a lucky few walked away from a sylveth encounter with some positive gift, though Fairlie had never heard of any such thing happening. Crosspointe was protected by the Pale, a fence of tide and storm wards that kept raw sylveth out. Worked sylveth—shaped and hardened by a master majicar—could be trans­ported across. It was inert—no danger to anyone. Fairlie couldn’t quite make herself believe it. She worked with it—chiseling and sculpting it for whatever she needed it to be, from jewelry to sculptures. But she never trusted it. He appeared every inch the prince that he was. He had the family physique—a square jaw, broad shoulders, and long golden hair that he wore loose around his shoulders. He was dressed in green silk and velvet. His trousers were closely fitted in the current fashion, with a long vest to the middle of his thighs, and topped with a sleeveless surcoat, the shoulders rolled. His blouse was heavily embroidered and glinted with beads of citrine sylveth. He wore an exotic perfume—musky and spicy. It made Fairlie want to sneeze. "You’re late,” Shaye said, stepping forward to pull Ryland into a stiff hug. Fairlie smiled at them. Shaye was not the sort who was comfortable with such gestures, but he made allowances for her and for Ryland. It was amazing that the two were friends at all. The Majicars’ Guild and the Merchants’ Commission hated the king and Rampling rule. Shaye’s uncle, Nicholas Weverton, was head of the Commission and a loud voice condemning the crown. "What, have they made you a mastersmith already?” Ryland demanded, turning to Fairlie. Fairlie stared. From Shaye she expected this sort of thing. But Ryland? He had to think about his family and the crown, and he always acted décor­ously and carefully. "Shaye, tell him he can’t.” Fairlie made the appeal, knowing it was useless. "Leave?” Ryland asked, glancing askance at Shaye. "Really it’s because she thinks I’ll never get my master’s badge if she doesn’t run off to the hinterlands and leave me alone to work,” Shaye confided to Ryland with a curl of his lip. "Me? I’ve not been back for hardly a sennight and I’ve barely had a chance to see you. It must be Shaye’s fault,” Ryland objected. "Or maybe she’s offended that you cannot make a moment in your schedule to visit her,” Shaye retorted. "You are more than two glasses late today, and about to run off again, unless I misunderstand the meaning of that collection of papers.” He nodded at the stack of papers and slender ledgers that Ryland had set down when he entered. "As it happens, I do need to get back. But that can be blamed on you,” Ryland said with a sour look at his friend. Shaye turned to face him. His lips turned up in a faint smile. Fairlie shook her head. Shaye enjoyed sparring with Ryland far too much. "He listened to Vaughn,” Ryland said in a bitter voice. Fairlie reached out and gripped his arm. Vaughn was Ryland’s elder brother, whom he idolized. A few months before, in a scandal that had shaken the castle to its foundations and resulted in the king’s summoning Ryland home, Vaughn had publicly broken ties with his father and his family. For the first time in Crosspointe history, a Rampling had turned against the crown. It was worse than if he had died. Ryland could hardly speak of him, and when he did, it was with a venomous anger that wrapped a terrible, bloody hurt. Fairlie’s throat ached for him—ached for them both. Vaughn had always been one of her favorite people in the castle. He had a quick wit and a generous smile. He’d always let her win at cards, and he kept her favorite candies handy for whenever he happened to see her. Fairlie spun around. She’d not heard the pocket doors to her forge slide open. Now the delegation of master metalsmiths filled the doorway. Her stomach twisted. All five of them looked stern, eyes opaque and shuttered. Master Lowe, the Dean of the Metalsguild, stood in the middle. His arms were folded, his hands tucked inside his voluminous sleeves. He wore a high-necked robe of black dosken, the arms cut out in a filigree lined with yellow silk. His shirtsleeves showed a rich emerald from within. Like most metalsmiths, he was a bulky man. His hair skirted his skull in a thick fringe of shaggy brown, a close-cropped beard covered his jaw, and a large and unformed nose grandly protruded from above his lips. Scars and flecks of red where he’d been burned hashed the round dome of his bald head . On his chest was pinned a badge. It was two crossed hammers made of silver on a bed of sylveth flames. Behind the flames flickered a gold anvil. Dangling from the bottom and attached by two gold chains was a thirty-two-rayed compass, the symbol of Crosspointe and of Master Lowe’s position as Dean of the Metalsguild. Fairlie clenched her hands, hiding them in her pockets. Her mouth was tight and dry, and her heart galloped in her chest. Whatever she’d said to Shaye and Ryland, this meant more to her than she could to say. She was good. She knew it. But was she good enough? All the craft guilds liked to be selective, even punitive, when it came to the master ranks. Too many masters made for too much market competition and lowered prices on everybody’s work. No matter how good her work was, they could not allow too many journeymen to advance. And she didn’t have the friends or connections in the guild to smooth the way. There had been only Toff, and Toff was dead. Fairlie could only stare. She had been certain they would refuse. Her mind seemed frozen, unable to turn in another direction. "Well? Have you nothing to say?” Master Lowe demanded, his large knotted hands slipping from his sleeves to perch on his hips. "I... thank you,” Fairlie said lamely. Suddenly she was enveloped in a bony hug. "I knew you could not fail,” Shaye said into her ear, then brushed a kiss against her forehead. Fairlie stiffened, leaning back to look at him. "Gala?” she asked sus­piciously. A mixture of pleasure and complete horror raced through Fairlie. She pushed back, flicking a helpless look at Shaye, who grinned maliciously. She glared. Before she could say anything, Master Lowe intervened. "If I may?” he asked, reaching out a hand behind him. Master Dorset passed him a polished ebony box, her pocked face looking severe. Master Lowe thumbed open the latch and slowly lifted the lid. Inside, on a blue silk pillow, was a master metalsmith badge. He took it out and stepped forward. Fairlie’s breath caught. She couldn’t look away from the heavy jewelry as he pinned it to her wool vest. His thick, scarred hands fastened it with unexpected deftness, then settled heavily on her shoulders. She looked up, meeting his solemn gaze, her heart pounding with elation. She’d done it! He reached inside his robe and withdrew a crisply folded linen paper. It had been sealed, a trace of the blue wax still smudging its edges. Fairlie took it and turned it over in her hands. It was addressed to Master Lowe in the bold, scrawled hand of Toff. She pressed her hand to her mouth to cover the crumbling weakness of her chin. Her eyes burned with tears. She blinked them away. "To visit my mother,” Fairlie said softly, still looking at Toff’s letter. The expressions on the faces of his fellow master metalsmiths were dour, but each nodded and murmured congratulations, shaking Fairlie’s hand as they filed out. Fairlie and Shaye both nodded, she still clutching the parchment bemusedly in one hand and stroking her fingers over her badge with the other. "We’ll see,” he said, and then stomped out. Ryland rolled his eyes and fluttered his fingers at Fairlie, then followed after the glowering Shaye. Fairlie fastened the door behind them and went to sit on a stool. She felt strangely numb. For several minutes she stared into space, absently crink­ling the parchment between her fingers. At last she unfolded it. It contained only a few scrawled lines. She frowned at them. She wasn’t a good reader, and Toff’s hand was bold but poor. Slowly she made the words out. It has been far too long, and I fear that we will not see each other again this side of Chayos’s Altar. I expect to cross the Veil very soon. There is nothing the majicars can do for me. As I put my affairs in order, I wish to recommend my apprentice, Fairlie Norwich, to the rank of Master. Her talent outstrips even mine, and you know that I have never been accused of being humble. I must ask you, my friend, to see that she achieves what she deserves. She is ready, as you will see for yourself. Do not let politics interfere. I know that I can count on you in this matter. THE BOLDLY FLOURISHED signature that followed took up fully a quarter of the page. Fairlie traced a finger over the lines, reading them again. Tears slid down her cheeks, and her heart felt squeezed. She remembered how he’d written a stack of letters just before his death. He’d refused to give in to the pain of his illness and had forced his body to carry him about the business of his dwindling life. She was certain that this missive had been in the last stack she had posted for him the day before his death. That was nine months ago, and Master Lowe had waited for her to apply for mastership. Would he have sought her out if she had not? He seemed very kind at the end—perhaps it had been the politics. So many rivers of intrigue ran through Crosspointe, it was impossible not to get caught up in a current— or several. She swiped at her tears, folding the letter and pressing it against her knotted stomach, painful happiness blooming inside her. She touched the badge, heavy against her chest, a slow smile bending her stiff lips. Toff had believed she was a master metalsmith. That was a treasure beyond all count­ing. She stood and put the letter away in the drawer of her nightstand. Then she changed clothes and headed for her forge. It was time to get back to work. 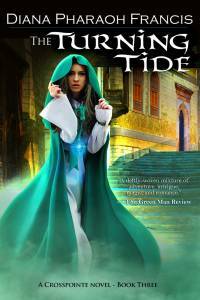 Lucy Trenton's ability to sense magick is one of her most dangerous secrets. But only one.